Newborn baby boy featured in his own custom video slideshow presenting the images from his newborn session. Aren't these family images amazing!? I truly love my job and capturing all sorts of images of baby, but these family images really tug at my heart strings. There is nothing more precious than a new life and seeing her wrapped in these loving arms just makes my heart happy. It was such a pleasure to photograph darling baby Zenn and her family for her custom newborn session. She was an absolutely amazing baby girl and her big sister was so helpful and caring towards her. I loved seeing their connection and was thrilled to be able to photograph them together! I welcomed baby Sophie into the studio with her amazing family in February. She was absolutely the sweetest baby girl and I was so happy to be able to provide these images to her family. To be honest, I was a little nervous at first because Sophie's mom is a local photographer and knows her stuff! But, once we got started, my nerves melted away and we got some amazing shots! Handsome baby boy newborn portraits with Everlast Photography, Edmonton and Spruce Grove newborn and maternity photographer. It was really important to Zena's mom that we capture family images during this special time. And, I totally agree with this. Who wouldn't want the whole family included during their newborn session? During the first few days and weeks after a baby's arrival, everything can be changing so much. It's important to capture things how they were in the moment and to look back over the years and remember it all. That is why newborn sessions at Everlast Photography include family and sibling poses - because they are important. Koen is the youngest of four siblings in his household and the 64th grand baby in his family! He is going to have such a fun childhood growing up with so many brothers, a sister, and many cousins to play with and watch out for him. This little bundle of cuteness surprised everyone when he arrived a couple of weeks early! Welcome to the world little one! He was born at just under 5 pounds but was in complete health, so we arranged for his portrait session in the 5-12 day window. Caleb was the star of the show and stole our hearts with his adorable features and gentle demeanor. Click to read more about Caleb or call 587.357.9738 to book your newborn session with Everlast Photography. Malaya's parents first met with me during their consult for their custom maternity and newborn portraits. They were expecting a baby girl and they had so many lovely ideas for their sessions. Malaya's parents wanted to incorporate several symbols and items into their session. And, I was so excited because I am a very sentimental person and couldn't wait to make this session extra special for this family as they begin this new chapter in their lives. Click the video below to view Wyatt's custom slideshow of himself and his family. He had a wonderful newborn session and we were so happy that he shared so many smiles with us during his session. Please leave a message below for Wyatt and his family. We loved being able to capture some more clean and classic images for Wyatt's family as well his customized poses. Having so many great images of such a special time is so important for families. Being able to remember all of the details and look back as years go by is so wonderful for parents, siblings, and other family. Once day when Wyatt is older, he'll get to see these too! Nathan is the third child in his family. He has an older brother and sister. They have so much love for this little guy and they were so happy to be able to take part in Nathan's portrait session. If you'd like to book your newborn portrait session and have your sibling poses included at no extra charge, then contact us. Hannah's custom newborn portraits were simple, sweet, and perfect! These images will look great on the wall of her nursery. If you'd like to know more about creating your own custom newborn portraits with Everlast Photography, please contact us at kdyck@everlastphotography.ca or call 587.357.9738. We look forward to working with you! I couldn't be more thrilled with having two beautiful twin girl newborn babies in the studio recently! These two precious gifts couldn't have been more calm and peaceful. They were a newborn photographer’s dream! It was certainly a team effort! Mom and Dad worked in tandem to ensure each babe was changed and had a full tummy, to make sure they were comforted when needed, and to assist me when I needed an extra hand in posing. It was such an honour to be able to provide this loving family with these treasured moments for their family to enjoy for years to come. I look forward to having these two back in the studio for future portrait sessions again! Have questions about your upcoming newborn portrait session? Send them my way at kdyck@evertlastphotography.ca or feel free to give me a call at 587.357.9738. I’m always happy to chat! 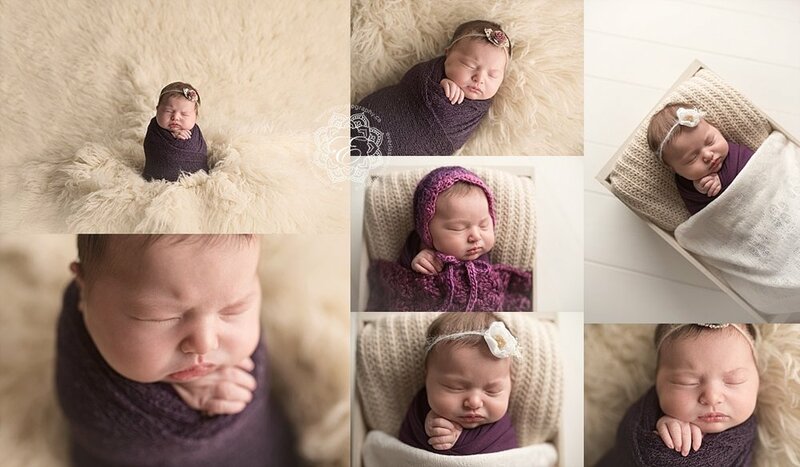 Edmonton Newborn Photographer recently had the honour of capturing a new baby girl's newborn photos for a special family that made a trip all the way from Red Deer for their session! I am so glad I was able to do this for this family. Everly is amazing! She is the sweetest babe and I just loved her red hair! She gave us some pretty cute faces too! Edmonton maternity and newborn photographer captures stunning mom-to-be in an outdoor location for her maternity portrait session.